Image above: The SkyShield on an Arduino Nano. At iFARM we flew the new Saturn V Rig with SkyShield autoKAP controller for the first time. Two weeks of spring have passed since then and I have not had a chance to fly it again, so I thought I would solicit your help. 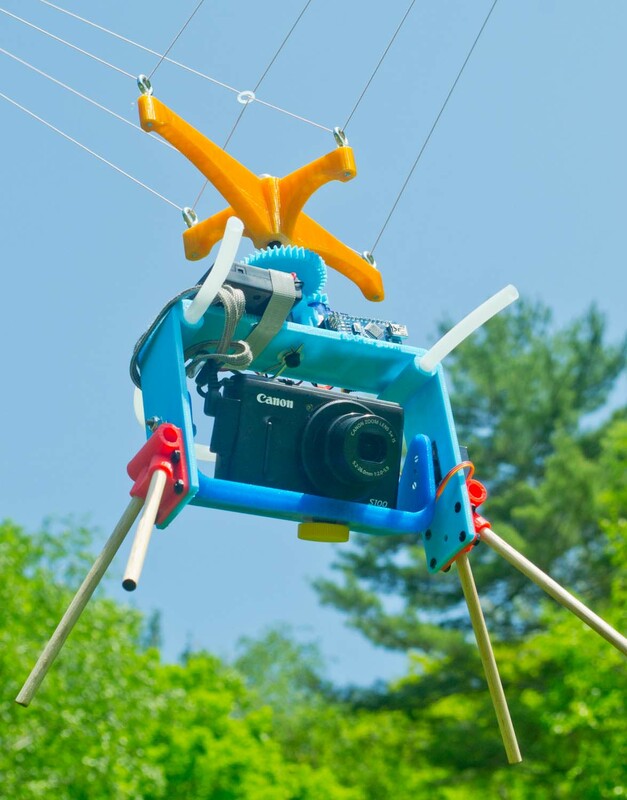 I have put together a few complete rigs that are ready to fly (just add camera and batteries), and I am offering these at a low price to anyone who would like to try one out and let us know how it went. The beta version includes everything here except the camera. It requires minimal assembly and could be ready to fly in 30 minutes. Sometime this summer I will offer a kit to build the rigs. These kits will require soldering and some drilling and gluing, and include all the components of the Saturn V camera rig, a Picavet suspension, two servos, the SkyShield controller, and all the cables, battery cases, etc. The target price will be under $150. The finished product will allow secure, damped camera mounting and autonomous pan and tilt motion with programmed camera shutter triggering. I am currently offering completely assembled and tested rigs for $125 to those who would like to post a research note or two about your aerial experiences (US shipping only). Some details of the rig could change as the design is refined, but the beta rigs are fully functional and highly modifiable. All the hardware designs and software are open source and freely available. 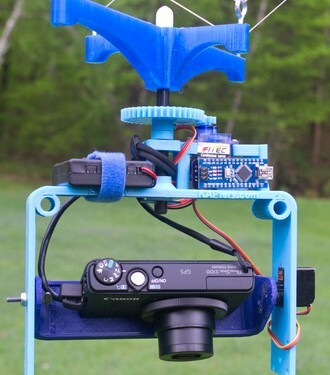 The 3D printing models are at Thingiverse, and the SkyShield designs are at GitHub. The Arduino Nano (DCCduino) is loaded with a sketch which includes eight pan/tilt regimes which can be modified to your liking if you have the Arduino programming environment. This sketch will be at GitHub as soon as I figure out how to put it there (I put some effort into figuring out how to add a single file to a GitHub repository and never got close to learning how to do it. Apparently not as "open" as some would have you believe.). There is more at The KAPtery about the last seven weeks of my life during which this rig went from nebulous concept to distributable beta product. In that article Don Blair is given credit for his critical contribution, but here I just gave him secondary authorship because it was easier. Sold. I just ordered one. Fun to see the Chris/Don team put this together so quickly. I like the modes selection capability and look forward to trying this beta version. Excellent @patcoyle. I'll ship it tomorrow. Do you know which camera you are likely to use on it?